Those that like playing online slot machine games and also have an affinity for classic novels will love “The Invisible Man”. Net Entertainment has long been known as one of the most innovative slot machine developers on the market for years. The “Invisible Man” is one of the most popular books of the last 100 years. To mirror that, the slot machine game is one of the most popular of its kind as well. It has a creative design, fun gameplay, and many different ways for players to win and bonus their existing winnings. Before anyone gets started playing this game, they must first understand what all of the symbols are and what they do. The most basic symbols in the game are the playing cards. The playing card symbols range from the 10 card to the Ace card. These are the lowest value symbols in the game. The higher value figures in the game are all represented by characters from the actual Invisible Man novel. The two most important symbols to know about in the game are the Griffin Wild and the Policeman Wild. The policeman wild appears only on the first reel of the game. It can be used to represent any symbol to create a winning combination. The Griffin wild is named after the main protagonist of the book. The man who turns invisible himself. It appears on the fifth and final reel of the game. These wilds can also trigger free spins. If they both appear on a spin at the same time they will trigger ten free spins. There are also a lot of great bonus games within the Invisible Man slot machine. There are two different bonus games. The two bonus games are the Police Spin and the Griffin’s Rage Bonus. 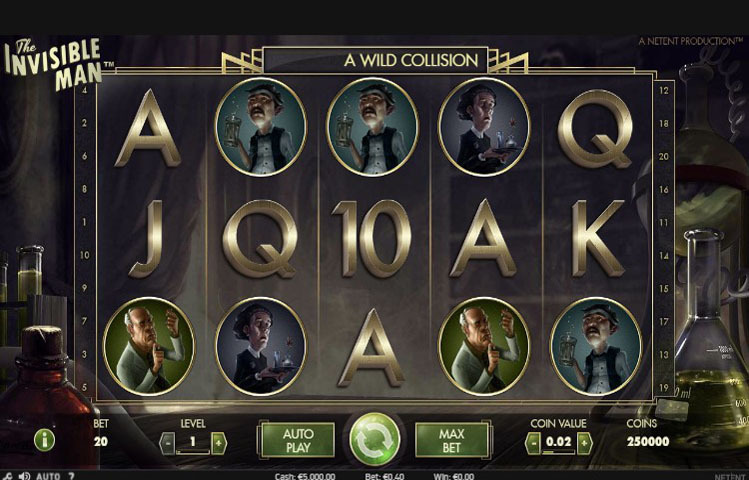 Both of the games offer the player a huge opportunity to increase their winnings without spending any additional money on bets for each spin. They are filled with wilds and other ways to get winnings up in the stratosphere. Before each spin, it is important that the player chooses the amount that they would like to bet. The bet button is located in the bottom left corner of the game. The interface of the game is highly customizable. Players can even adjust how quickly the spins go during gameplay. The game is available in multiple different languages so that slot machine enthusiasts can play no matter what country they are from. There is a reason that “The Invisible Man” is one of the most popular online slot machine games on the internet. Its sleek gameplay, high payouts, many different options for winning, and customizable gameplay are just a few of the reasons that it is so popular. Net Entertainment is known to be one of the best online slot machine developers on the market and they continue that trend with “The Invisible Man”.